More than 150 of your higher ed colleagues have dramatically improved their web and social media writing skills by taking this constantly updated professional certificate online course since 2012. Want to write stronger Social Media and Web Content for Higher Ed? Do you write the content for your school’s website or social media channels, even though you’ve never had any formal web writing training? Has social media and web writing recently been added to your job responsibilities at your university, college or school? Do you need to optimize your web content so it ranks well in search engine results, gets shared on social media and is read by your target audiences? Web writing for higher ed is not easy. It is very challenging to master without guidance and practice. We want to help you as we’ve helped more than 150 of your colleagues working in universities and colleges. This course was designed for YOU, to help you learn more by practicing and improve your web writing skills as result. What will I learn about Writing for the Web and Social Media in Higher Ed? working on weekly web writing hands-on assignments you can use the next day at work: program page, email message, tweets, blog posts, user persona, page template, etc. Sofia is the web writer and communications officer for Arts, Sciences and Engineering at the University of Rochester. As part of the web team, her work includes creating, editing, and curating content for the university’s homepage and top-level pages, departmental web pages, and social media accounts. 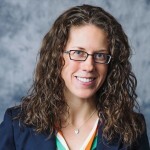 She regularly co-hosts on-campus presentations and workshops about strategic and tactical web communications. Before joining UR, Sofia worked as the assistant editor in the marketing and communications department at Nazareth College. Her work as part of the teams at Nazareth and UR has been recognized with awards from CASE and PRSA. Sofia earned her master’s degree in English language and literature from Queen’s University in Canada. She is currently pursuing her master’s in online teaching and learning at UR. Sofia is also a graduate of the Higher Ed Experts web writing certificate program, and is now its instructor. Should I take this course on Web Writing for Higher Ed Course? No travel expenses or down time while you learn much more than you would by attending any workshop or conference: 4 weeks give you the time to absorb all the concepts and acquire new skills. Your classmates will all work at universities, colleges or schools: you’ll find out how other institutions tackle web writing challenges. Letting Go of the Words, Second Edition: Writing Web Content that Works by Ginny Redish (KINDLE version). Recognized certificate of achievement in social media and web writing for higher ed upon completion of the course with a final grade of 80% or more. Are the webcasts at specific times or are they pre-recorded? The screencasts are pre-recorded, David. All our courses are asynchronous (you study whenever you have the time as long as you meet the weekly submission deadlines for the written class discussion and assignment). If I am on vacation one of those weeks can I play catch up the next week? or are assignments due every week? There are weekly assignments and asynchronous class discussions. We can offer some flexibility around deadlines to work around vacation time during our summer session. I really enjoyed the Social Media & Web Writing Course. This is my third online learning opportunity with Higher Ed Experts. These courses are so helpful, because the content is immediately applicable. There aren't very many places you can go to get instruction that you can use right away to improve your effectiveness in your marketing position in higher ed. I recommend this course. It informed my writing through a better understanding of users and digital platforms. I also learned how to use tools more effectively. It's given me the confidence to show and help guide my colleagues. As someone new to higher ed communications, this was a great course. I have a background in reporting and while that comes in handy for some press releases, web writing requires us to think differently. This helped me figure out how we want our college's voice to come across, whether we're writing a student or faculty profile, or an academic program page. The timing was also great, as our university is in the midst of a website redesign that we requires us to rewrite a lot of our content. I was able to use a lot of the assignments either for current work projects or stories I had been meaning to write but hadn't gotten around to. Professor Sofia's feedback was also extremely helpful each week, both in the class discussions and individual assignments. It was also great to see how my classmates approached the assignments and learn from them. Overall, a great course! I would absolutely recommend this course! This was hands down, one of the best online courses I have taken. The way the course is designed, the valuable feedback from my peers, and my instructor's very detailed comments and suggestions really taught me how to lead with content. Looking forward to taking additional courses! I recommend this course for anyone who writes web content, whether a newbie or a veteran. Each component of the course imparts valuable information on how and why web writing should be done properly. I've been a news and web writer for a long time, but I still learned numerous lessons and tips that will help me improve. The modules on keywords, search engine optimization and personas were particularly useful. Because of this course, I feel like I'm much better suited to not only produce better web content for my university, but also to help the content providers in other departments to maintain a consistent message, voice and style. A must-take course for anyone who's new to higher ed writing. The course helps you think about your purpose for what you're doing. It allows you the opportunity to step back and reexamine your habits and perceptions. I highly recommend this course for anyone who writes social media posts, emails and web copy for a higher education institution. It turns institutional voice upside down and helps writers focus on the audience. I would absolutely recommend this course! Throughout the four-weeks, we began building on a variety of concepts specific to web writing through discussions and weekly assignments, and by the end, we had the opportunity to create a project that could easily be used in the workplace. I'm amazed at the amount of resources we had available, too. You won't regret taking the course! I highly recommend the course. As someone who is responsible for creating content for my department web page, but is not a trained writer, I found the course content and assignments to be very valuable. I now have a much deeper understanding of the need to plan my content strategically. I've also gained the knowledge to produce that content in a form that is more likely to be read and shared. I would recommend this course to any web writers working in a higher education institution. The course materials and assignments are engaging, and I received valuable feedback from my classmates and professor. From the first week of the course I started applying the skills I learned to my work. I believe I'm now a better web writer thanks to this class. I would absolutely recommend this course to any person managing digital communication. This course provides critical knowledge that is immediately applicable. I'm feeling extremely more confident in my ability to deliver information in various digital channels that will produce the results I am seeking. Our instructor, Sofia, is an outstanding instructor and I highly encourage others to enroll in this course! I would absolutely recommend this course. This course added valuable tools to my writing toolkit. I’m walking away with countless resources and new skills to directly apply to my work. I would highly recommend this course to anyone writing for the web in higher ed. I so appreciated the specific focus on web writing for the education world in this course, as many general tips and recommendations are aimed at other kinds of establishments, like retail businesses. This course made me feel more confident about SEO and social media too, which is what I was looking for. I would recommend this course to anyone in higher ed who wants to learn to write online content. It teaches regular web, email and social media writing tactics applied to the specific environment and requirements of a higher ed institution. I would recommend this course to all of my colleagues. I was able to see my writing progress throughout the 4 weeks of the course and have already been applying the tactics learned to my web writing in my current role. It's an excellent course. Be prepared to do work. The more you put into it, the more you will get out of it. The feedback from the professor and class peers is invaluable. I would highly recommend this course. I have already spread the awesome news about this class to my coworkers. I would tell any colleague that this was a perfect learning experience. This class allows you to work around your busy schedule and accomplish tasks and assignments in a realistic amount of time. Plus, the feedback and resources shared by the instructor were so helpful! This class is amazing. It covers so much content and yet everything is presented in an interesting and engaging way. I learned a great deal and received valuable input: on weekly assignments from the professor and on my discussion assignments from the professor and my classmates. The assignments are relevant and what I learned is applicable to my job on a daily basis. The class assignments themselves are even set up so that in doing them, you are creating web writing projects that will potentially benefit your university while enabling you to learn! I would recommend this course for anyone who writes web content for their university, even if it isn't the main focus of their job. These days there are so many different people contributing content to institutional webpages, and it's imperative that people understand the difference in writing for the web compared to other forms of writing. This course was great for reminding me of some of the basic rules for web writing, but also helped me hone my skills and learn new trends as well. I highly recommend taking this course. I was especially thankful to get feedback on my web writing, which I found very useful. The SEO material has already changed the way I approach our content. This course gives you a series of small changes you can make from day one. 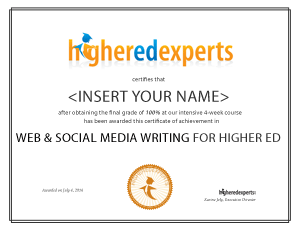 The Higher Ed Experts course on web and social media writing exceeded my expectations. I learned many helpful strategies and it challenged me to assess what we currently do at our university and how we can improve our web writing and content. I would highly recommend this course. I really appreciated the prompt feedback and chance to have some dialogue around our assignments in this course. Two exercises a week plus the commenting seemed like a good balance of the theory and practical. A substantial way to expand knowledge of marketing tactics, this course will help you write to identify and entice your college audience by using information guides to unify your website. "Web Writing for Higher Ed" taught me to be more strategic about web communications and how to write compelling stories. The class helped me develop specific methods and easy templates that will allow communication with different web editors in my organization. Learning about the importance of microcontent, readability scores and the importance of SEO will increase the findability of our web pages, and improve the quality of our social media posts. Every lesson was well thought-out, with appropriate homework assignments that allowed me to put the theory into practice right away. The feedback we received from our instructor and other participants was always constructive and very helpful. This course is a terrific way for web writers (and their supervisors) to improve their understanding of web writing best practices in the context of writing for higher ed websites and digital/social media marketing. This course will provide you with the foundation to produce actionable guidelines and templates for web writers to make their web writing more engaging and more consistent. I would highly recommend this course to anyone wanting to improve their web writing or their ability to provide meaningful edits and practical feedback for their web writing team members. You will learn a lot. I started applying the knowledge obtained during the course right away to the website at work. It made me look at our content with "new eyes". I think the course has made me consider my audience more and I have a better understanding of how to adapt our web content to suit their needs. The continual assignments and grading meant that I really had to work hard and be actively engaged, rather than just passively reading. I did more writing over the past 4 weeks than over the past year. And the personalised, detailed feedback from the teacher was invaluable. I'd be delighted if all my colleagues would take the course so we could all start working towards the same goal. I would recommend Web Writing for Higher Education to anyone involved in writing and working in a communication or marketing department. It gives great examples of changes that are simple to make but make a large difference in the readability and focus of your website and web content. The tools provided toward the end of the course for content templates can be especially practical for certain kinds of content that are often repeated. From learning how to write microcontent to learning content strategy, this course will increase your collection of tactics and improve your web writing proficiency. I am already applying newly learned strategies to my work and am a better web writer because of this class! I would definitely recommend this hands-on course to anyone writing for the web. It includes lots of practical tools and techniques, best practices for higher ed websites, as well as valuable feedback from the instructor and your classmates. The four weeks had gone by quickly and I definitely completed my online course better equipped with the right tools and skills to communicate with my audience. I would recommend higher ed content managers and writers to take this course. It'd either serve as a good refresher, or even better, you leave with new ways to do your old job. This was very helpful and gave me a way better understanding of how to communicate to our audience. Having just graduated university in the past two years, it's been a challenge switching from academic writing to less "formal" and more conversational. This course was FANTASTIC for that, and also helped me understand why my manager gives me the feedback she does. I would definitely recommend this course to anyone whose job responsibilities include any kind of web writing. Whether you're creating content for prospective students, current parents, alumni, or donors, the tools and techniques taught in this course can be applied across all facets of higher education! This course was a great way to help those of us trained as news writers to learn how to adjust our copywriting to the needs of the web and social media. I would recommend this course to anyone who touches web or social content or who interacts with an audience through writing. The lessons were extremely practical. I was able to implement what I was learning the next day at work--to very positive results! This course has renewed my excitement for work and has given me data-driven ways to improve our websites, social content, and even emails. It met and exceeded my every expectation. This is the perfect course for anyone new to higher ed content and communications and for those who are seasoned veterans. This course exceeded my expectations. It confirmed some of the things I thought I knew and taught me more in 4 weeks than I've been able to gather through independent readings for years. I recommend this course to anyone involved in higher ed websites or social media. It's very practical and everything you learn can be implemented on your site immediately. I highly recommend anyone in higher ed who is tasked with writing web content, social media posts, or email campaigns take this course. It's important to learn the distinction between writing for print and writing for the web and this course will give you that education! If you write anything for the web, you should take this course. You will look at all of your pages and content with a new perspective. I found this course valuable, because of how directly it applied to my work. Each week there was something that I immediately began applying to my daily tasks. Sometimes it was just a small detail or fact, other times it was a completely new process for writing certain types of content. But each week's lesson gave me greater proficiency and skill in my work. I've already recommended the course to the other writers in my department. I would recommend the course to anyone interested in preparing web content. There are also take-aways for what works in print as well. I really enjoyed this class and am glad I chose to take it rather than attending a conference. This course was very helpful in teaching me how I could improve my websites. Whether the assignment was on readability, SEO, or creating tweets, I was able to apply each one to my work. I will continue using what I learned in this class every day. This course has been great. I learned so much that I can put immediately to use, and the instructor provided a great deal of valuable feedback. I am much more confident in my web writing and have valuable tools that I can continue to use. If your institution is considering a website overhaul, this is the course your writers should take in preparation. In higher education, we tend to get lost in the academic jargon trying to explain why students should choose us, instead of choosing a voice that asks students what THEY want. This course helps put that into perspective and practice. I'm excited to share what I've learned with my colleagues, and hope they will consider enrolling too! I would definitely recommend the course. You will learn about a lot of tools to help you get organized for social media/web writing as well as learn best practices. The course was very applicable to what I do in my job. Our sites haven't changed much in terms of lay out or format since they were first developed eight years ago, but we learned how we can lay out/create web/email copy in a more effective way, and I now know how to move ahead in a positive, powerful and useful way. This course jumps right into learning. The assignments and discussions push you to use the information you're learning and apply it as soon as possible. The interaction from the teacher and classmates was so helpful and respectful. I recommend this course for anyone who works with content on the web. I think the course is valuable, especially if a student doesn't have a lot of writing or web/social media experience. I would recommend this course. I learned a lot in a few weeks and challenged myself. I can't wait to put everything I have learned to good use. And, Sofia Tokar was a wonderful instructor! Yes, I would recommend this course to anyone who is working on a website for a higher education institution. Writing comes in many different forms and if your background isn't completely marketing or web driven, this course can help you gain a better understanding of how users interact with your website and social media. I would definitely recommend this course to anyone who has involvement with writing in higher education. Whether it's website content, email messaging, or messaging internally to students and faculty, this course has helped immensely. Sometimes we get caught up in the technical speak of the field and lose sight of the important messages and the way to communicate them most effectively. This course helps you determine what's important and how to get the information to your audience. I've learned a great deal about the fundamentals of writing for the web and social media. The class material is very relatable to my work, and the class discussions are a great forum for help from other professional writers. I found the course to be quite refreshing. In an age where we are bombarded with information from every direction, this course strategically arranged information into consumable nuggets that were easily digestible. Each piece of content was laser focused to address the topic. I didn't feel like my time was being wasted with bloat. We use a lot of jargon in Human Resources, and the material isn't always exciting. This course made me rethink organizing my written material so that it is a great deal more succinct and appealing to the reader who is just trying to get the facts, fast. I was worried the course wouldn't be applicable to me since I'm not recruiting students, but it was! You can learn a lot of concepts about web and social media writing in a short amount of time, and homework is pretty challenging. I was really impressed with how much I learned in this course--and how many tools there are to employ when writing for the web! In most online courses, you're just on the receiving end for a couple hours and you are advised rather than forced to try your hand at certain exercises afterwards. With a multi-week session of exercises and feedback, I got a lot more information ingrained. I definitely would recommend this course to others. This course also was recommended to me by one of my colleagues who had previously taken it. I've been using what I've learned in this course from day 1. The idea of content templates is going to help tremendously as a work to update our academic program pages over the next few months. The course is time-intensive. The course may be helpful for others who want to learn how to write web content, learn about optimizing pages for search engines, and to some extent writing for social media. I would recommend this course for web writers or individuals who manage web pages and social media. The Web Writing in Higher Education course was incredibly helpful in improving my skills as a higher ed communications professional. The format allowed for varied learning styles through video, text and hands-on instruction. The assignments were challenging but so beneficial, and nearly every assignment I'm actually hoping to use word for word (well, as close as I can get to it) as we move forward with redesigning our website. I can't say enough great things about this course. Oh, and make sure you read the entire textbook, cover to cover. It's amazing. Great class, goes beyond the basics. Participants get much more out of this class than just a webinar or conference. 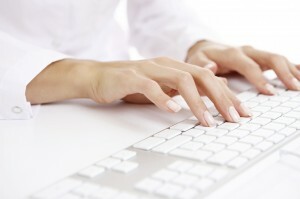 Individuals taking the courses should have a writing background. Web delivery if course was great. I found Higher Ed Experts' Web Writing in Higher Ed course to be a great way to catch up on current trends in web writing, as well as brush up on industry standards. The course helped me tune my writing to the right audience and use less words to tell a better story. I'd absolutely recommend this course! This course challenged me. In my 8 years in higher ed web marketing, I have always thought the unfamiliarity with web authoring tools was why our web content contributors struggle. I came to the realization that perhaps it's their lack of confidence in writing and the challenge writing for the web presents. I learned some techniques and strategies to help coach our contributors as well as strengthen our overall strategy and approach to web writing. Many thanks for your offering of the online course Writing for Social Media & the Web in Higher Ed! Within one week of earning my certificate, I am already working on an updated web plan for our entire online presence. Professor Michael and the course development team should be proud for making such real-world impact on your newly graduated students (and their higher ed homes)! Great class! It's an excellent combination of coursework, relevant examples, instruction, and feedback. Really enjoyed the links to resources for more info.